New Monthly Resources to Evolve Yourself & Your Life. Resources Such as Training Videos, Audio Tools, Practical Exercises, Live Online Training/Q&A Events and/or Interviews With Experts. Access to Private Member Only Discussion Forums. 40 x Personal Growth Audios (Affirmations, Meditations, Visualizations). 10% off all Premium Courses/Programs by The Daily Positive. Your recurring membership subscription can be paused or cancelled at any time, simply notify us by email. "I have been working with Bernadette for a number of years through private coaching and her courses. But something about the Mindset for Miracles course in EvolveHQ truly resonated with me on such a deep and permanent level. I know I will never approach life in the same way again." "Bernadette, THANK YOU for all that you have done for me over the past year. You've been an incredible mentor (from afar) and I have grown and learned so much from all of the work I have done through this membership. 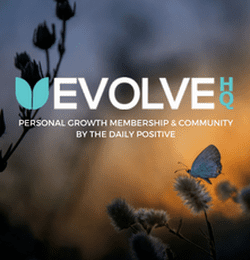 I have absolutely loved being part of EvolveHQ! I appreciate all that you have done for me! Can't thank you enough."